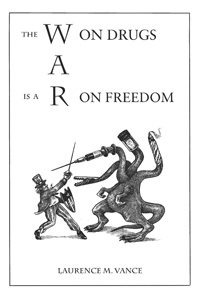 The War on Drugs Is a War on Freedom is an outstanding contribution to the contemporary battle for liberty. It has the potential to do great good, and Vance deserves high praise for his magnificent work. Laurence Vance has written a powerful book, a book that should be read by every American who is concerned about the principles of morality, freedom, free markets, the Constitution, and limited government. It seems Vance has launched a remarkable war of his own, conducted with superb generalship, against the drug war. Here is an example of just one especially effective argument in his campaign. The harms of tobacco and alcohol vastly exceed the ill effects of dangerous drugs, yet there is no call to ban them. Prohibition is recognized by nearly everyone as a failure, not to be repeated. If this is so, how can one justify banning less dangerous substances? Alcohol abuse and heavy tobacco use are two of the leading causes of death in the United States. It seems rather ludicrous to advocate the outlawing of drugs and not the outlawing of alcohol and tobacco. (p. 11) Vance writes from a viewpoint that will surprise many readers. He himself does not condone the use of dangerous drugs. To the contrary, he is a Christian and a Bible scholar of considerable note and he regards their use as sinful. "As an adherent to the ethical principles of the New Testament, I regard drug abuse to be a vice, a sin, and an evil that Christians should avoid even as they avoid supporting the government's war on drugs" (p. 79). If Vance takes this view of drug use, why is he so adamant that people have the right to consume these drugs? His answer will be of interest to all students of moral theology. He holds that Christians can with perfect consistency uphold the distinction between vices and crimes, with only the latter an appropriate area for forcible suppression. As Ludwig von Mises points out, "once the principle is admitted that it is the duty of the government to protect the individual against his own foolishness, no serious objections can be advanced against further encroachments.… And why limit the government's benevolent providence to the protection of the individual's body only? Is not the harm a man can inflict on his mind and soul even more disastrous than any bodily evils? Why not prevent him from reading bad books and seeing bad plays, from looking at bad paintings and statues and from hearing bad music?" Read David Gordon's full review. Does the Bible favor total war?